Sometimes I feel like a Super Mom. Like when I feed and change Sam on the back seat of the Subaru. Like when I survive a day trip to State College sans Nick. Like when I workout while Sam snoozes in his swing. Like when I bake three dozen pumpkin whoopie pies during his afternoon nap. Are whoopie pies still trendy? Because they were last year. Classic chocolate with a fluffy vanilla filling. Red velvet with a cream cheese center. 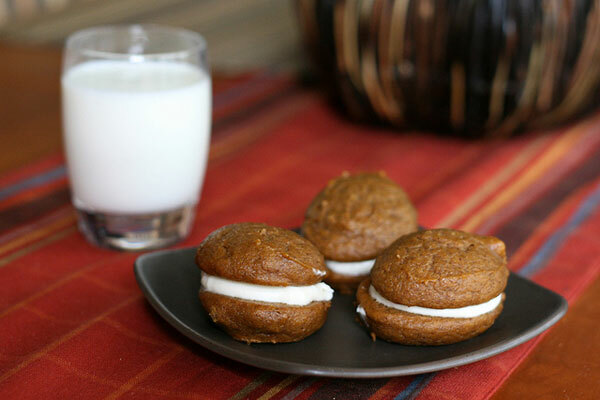 Gingerbread whoopie pies with lemon creme. Or the Wiley family favorite: chocolate with peanut butter. Regardless of if they’re trendy or not, my family has been baking them for generations, and we’ll continue to do so whether they grace the display shelves of urban bakeries or not. I suggest you make these whoopie pies. Then share them with friends and family. Even if they call them “gobs” like our western Pennsylvania relatives. And as for that whole Super Mom thing? Sometimes I’m lucky to shower and brush my teeth before noon. Makes about 2 dozen whoopie pies. Preheat oven to 350°F. Line baking sheet with parchment paper (or use a Silpat). In a large bowl, whisk together flour, salt, baking powder, baking soda, cinnamon, ginger, and cloves. Set aside. 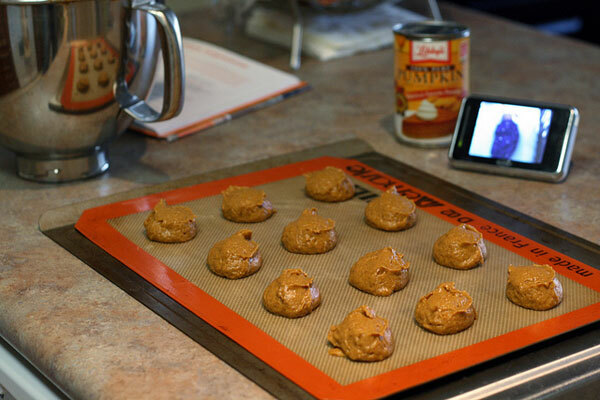 In a separate bowl, with an electric mixer, combine brown sugar and oil. Add pumpkin puree and mix thoroughly. Add eggs and vanilla extract and mix until combined. Slowly add flour mixture to pumpkin mixture until completely combined. Scoop spoonfuls of dough onto prepared baking sheet, about 1 inch apart. Bake for 10 to 12 minutes, until cookies just start to crack on top and toothpick inserted in center comes out clean. Remove from oven and move cookies to wire rack to cool completely. For the filling: With an electric mixture, beat butter until it is smooth. Add cream cheese and beat until combined. Add confectioners sugar and vanilla and beat until smooth. To assemble whoopie pies: Spread filling onto flat side of one cookie and top with another cookie. Refrigerate for at least 30 minutes before serving. These look incredible. You MUST be super mom. Glad motherhood is going so smoothly! Whoopie pies never go out of style 🙂 So impressed that you’re back in the kitchen already! 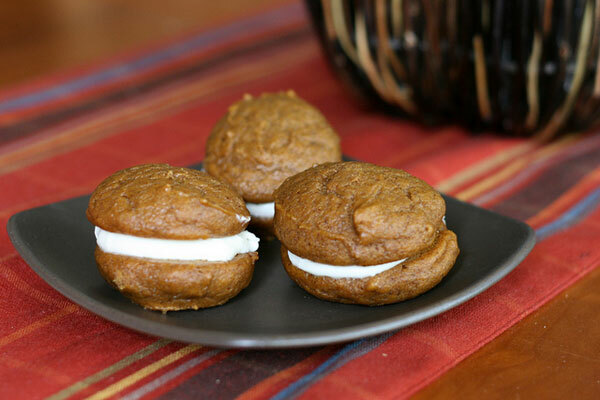 I didn’t jump on the whoopie pie train last year but I think I need to this year! Do they freeze well? I might need to make some this weekend to take for Thanksgiving. Is your Subaru a wagon? We are wagon people too! Sounds like I’ll be ready for motherhood 🙂 Hopefully, I’m a super mom like you! What kind of workouts do you do at home while he’s sleeping? These look BANGIN’ – definitely going to make these! These look so yummy! I am definitely holding on to this recipe! Jon just ADORES woopie pies. His mom still brings him some almost every time she visits. I have never even thought to try it with pumpkin. and ps – you totally ARE super mom! 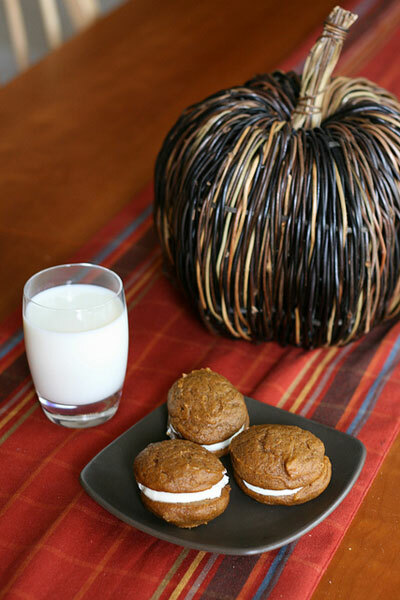 Nothing like bringing some homemade whoopie pies to a family gathering – my family LOVES them! I’m thinking of making these for Thanksgiving!